For the past five years or so, millions of homeowners have been stuck in their homes, unable to refinance or sell because they were underwater. That situation began to change in 2013 when the housing market finally began to show signs of life. Buyers across the country were back in the game and home prices rose in many communities. For many sellers this meant they could finally move out of a small house, cut down on their commute time, or simply go on with their lives. Almost 2 million homeowners came out from negative equity positions in 2013. If you plan to sell your home in 2014, be aware that buyers have changed since the economic downturn. They’re savvier than ever, and they’re not desperate. Many of today’s buyers are Millennials (also known as Generation Y) who’ve come of age with access to endless information via the Internet. It’s in their DNA to search, and they love photographs and sharing. Today, many buyers get their first impression of your home online. Too often, listings go online with photos of a dark room, lights off or blinds closed. Even worse? A new listing without photos or that has only one. If your real agent isn’t hiring a professional photographer to take high resolution photos, then you should invest the few hundred dollars to do so. Have them taken at the best time of day. Clean the home in advance and put away clutter. Prepare for the photo shoot just as you would for an open house. If buyers don’t like what they see online, you may never get them in the door. Nothing is worse than waiting months or even years for an offer, only to have potential buyers discover that your HVAC system is on the fritz or that there is dry rot. When that happens, you’re forced to reduce the price or give credits. Even worse, you may scare off the buyer and be forced to go back on the market. Often when this occurs, buyers and agents think there’s a problem with your property—which can make it tough to sell. That’s why a few hundred dollars on a pre-sales inspection is the best investment you can make. If there are issues, you can price the home accordingly. More importantly, you’re providing the buyers with more information. You’ll be in their good graces from the start. Receive an offer on your home at a good price? Have you been one of the lucky ones who received more than one offer over a short period of time? Good for you; you’re in the driver’s seat. Even so, you still want to be in the buyer’s good graces during escrow and even after the sale. If you have the opportunity, throw the buyer a bone. If they ask for an early closing and you can do it, give it to them. Negotiate to buy them a one-year home warranty or give them a small credit. These little offerings will go a long way toward a speedy and hassle-free escrow. The most important thing to remember is that to be a smart seller, you need to put yourself in the buyer’s shoes. Remember that today’s buyers lived through one of the biggest housing and credit crises in generations. They’re motivated but cautious, and they have a wealth of information available to them online. Don’t take anything for granted. Sacramento County’s median home price held steady in December at about $240,000, where it’s been stuck since midsummer after a big run-up in prices last spring, according to DataQuick. But the number of homes sold in the county last month was the lowest for any December in six years, the San Diego-based real estate information said Wednesday. There were 1,696 houses and condominiums sold countywide in December, including new and resale homes. That was the lowest figure since the days of the housing collapse when only 1,372 houses sold in December 2007. Last month’s sales were about 20 percent below Sacramento’s historical average for December, DataQuick reported. The reasons for the steady prices but low sales are a constrained supply of homes for sale, investors leaving the market, and higher prices and interest rates undermining affordability, said DataQuick analyst Andrew LePage. It was a similar story in Southern California and the Bay Area, where sales figures were also the lowest for any December since 2007, LePage said. In Sacramento, the drop in sales volume was not uniform. Sales of homes for under $200,000 were down by 48 percent in December compared with the same month last year. Yet sales of homes from $300,000 to $800,000 were up 45 percent, LePage said. Part of the reason is that rising home prices pushed many homes above $200,000, but it had more to do with investors cutting back their buying as prices rose, he said. Absentee buyers, generally landlords, bought about 30 percent of houses in Sacramento County in December, down from 44 percent a year ago, LePage said. Cash buyers fell from 42 percent in December 2012 to 26 percent last month. Should You Take Real Estate News Into Account When Buying? Gabe Cole bought and sold 15 homes last year as part of his sideline as a house flipper. This year, however, the Newport Beach, Calif., real estate broker anticipates his side business will slow down because foreclosures and short sales are drying up. While 2013 was the year of get-in, get-out quick house flips, he expects to do more in-depth remodeling work on higher-priced properties in 2014. "Since there are fewer short sales and fewer foreclosures out there," Cole said, "there's less business to go around." Many economists agree. They predict 2014 will see more investors retrenching and more buyers putting roofs over their own heads. That's not the only big change ahead. Home prices are expected to stabilize this year, while homebuilding will be more frenetic. "The housing market has staged a spectacular recovery over the past year," Cal State Fullerton economists Anil Puri and Mira Farka wrote in their 2014 economic forecast. "More recent data, however, point to a softening of these trends." Here are the top real estate trends we're likely to see in 2014. MORE INVENTORY: You can expect to see more people putting their homes up for sale this year, as rising prices bring new equity to underwater homeowners. Other property owners also may take the opportunity to get their lives off hold and take advantage of higher home prices. Donald and Stacy McCray are among them. Because of last year's price gains, they believe now is the time to list their two-story Orange County, Calif., house so Donald McCray, a railroad conductor, can move closer to work in Los Angeles. They plan to put their home up for sale later this month. "I'm hoping that, since interest rates are still low, it's a better opportunity not only to sell, but to rebuy," Donald McCray said. Another factor: New home construction is expected to increase further this year, further boosting options for home shoppers. NEW HOME SALES TO RISE: Nationwide, forecasters expect the number of housing starts to range from 1.19 million to 1.25 million, up from 975,500 in 2013. Builders are compensating for years of sub-par construction levels, said Robert Denk, an economist with the National Association of Home Builders. "There's a huge construction deficit," he said. An increase in homebuilding means that new home sales should go up, too. When construction levels fell, "buyers were forced into resale homes," said Irvine, Calif., housing consultant Mark Boud. Many buyers prefer newer homes, which have the latest designs and are more energy-efficient. "The reason (new home) sales will increase is we are supplying more product," Boud said. MORTGAGE RATES TO RISE: Interest rates for 30-year, fixed mortgages likely will rise this year, averaging somewhere in the 4.9 percent to 5.3 percent range, forecasters say. That's still low historically, but well above rates for the past 2 1/2 years. The average rate for a 30-year fixed mortgage had been solidly below 4 percent since late 2011. Last summer, it spiked to 4.5 percent. The Federal Reserve's decision last month to start reducing purchases of Treasury and mortgage-backed bonds likely will push up mortgage rates. But not wildly. "Rates are not going to soar because we're still in a pretty weak economic recovery," Denk said. "When the dust settles, (rates) are still a bargain." CREDIT MAY GET EASIER: After years of tight lending standards, homeowners definitely will have an easier time getting mortgages, said Svenja Gudell, director of economic research for housing website Zillow. After last summer's 1-percentage-point increase in mortgage rates, the refinancing business dried up for lenders. "They want to fill that void with purchase money loans," Gudell said. That may mean lenders may approve loans to borrowers with lower credit scores or higher debt. "So we'll see a lot of people who couldn't get a mortgage in 2013 able to get a mortgage in 2014," she said. For one thing, new federal lending standards take effect on Jan. 10, meaning that some borrowers will get more scrutiny and less money. The new rules will have little effect in most cases, Gudell said, since most loans already meet the new standards. But Chapman University economist Esmael Adibi said lenders will have more leeway with the loans they plan to hold in their portfolios. Tougher standards still will apply for loans that financial institutions plan to sell to mortgage giants Fannie Mae and Freddie Mac or elsewhere on the "secondary" mortgage market. "Banks are eager to boost their lending," Adibi said. "However, rates and requirements depend on the type of financial institution (offering the mortgage)." COMMERCIAL RECOVERY REMAINS SLOW: Forecasters say vacancies will drop and rents will rise this year in office buildings, shopping centers, factories and warehouses. More deals will get done and sale prices for buildings likely will go up. Nonetheless, the rate of recovery is expected to remain at moderate levels for commercial real estate. Commercial real estate recovery "tends to lag broader economic growth," said Deloitte & Touche's 2014 outlook. Nationally, commercial rent increases are projected in the 2.2 percent to 2.5 percent range this year, according to the National Association of Realtors. Household Sharing and its affect on the Market. The financial crisis and housing bust came with kids moving back in with their parents and parent moving back in with their kids. In many cases, kids just never moved out. UBS's top economist Maury Harris has argued for a while that the rise in shared households represented pent-up demand, which could eventually acted as a bullish force in the housing market. "Households' further venting of delayed, pent-up demand has been a key theme underlying our 50 basis points above-consensus forecast of 3% calendar average 2014 real GDP growth," wrote Harris in a research note to clients. "In 2013 a lower personal saving rate, renewed household borrowing, accelerating consumer durable goods spending growth and improved home sales were consistent with pent-up demand venting." He noted that the latest data from the Census Bureau showed a deceleration in household formation in Q3. But longer-term, he's confident that shared households will continue to fall as a percentage of total households. 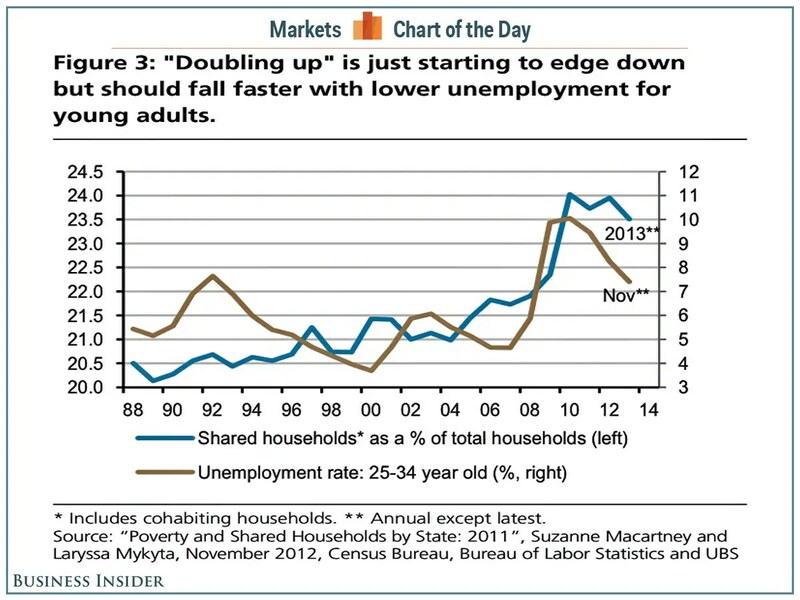 "Looking ahead, the extent of "doubling up" usually remains critical for household formation," wrote Harris. "In 2014 and 2015 we expect further declines in the still relatively percent of households that are shared residences as unemployment rates for young adults continue to decrease." "We see the unemployment rate, which stood at 7.3% in Q313, declining to 6.4% by Q414, with downside risks." Even though the new year began with list prices 11.1 percent higher than they were a year ago and at least 4.9 million homeowners have been freed from negative equity since 2012, inventories of listings are only 2.7 percent higher on December 30 than they were a year ago. Record low inventories last January set the stage for a selling season featuring soaring prices, bidding wars and the outbreak of price bubbles in several California markets. The improved conditions for sellers prompted many to list their homes, but not enough to measurable improve the inventory picture as real estate markets go into hibernation to prepare for the 2014 season. The national housing inventory of listings from the 54 cities tracked by HousingTracker’s weekly metro survey on December 30 was 676,170 single family homes and condos, only 4.1 percent higher than 648,938 listings in January 2013, the lowest housing inventory level ever recorded in the Department of Numbers database. Realtor.com also reported inventory numbers close to last year’s levels. The total U.S. for-sale inventory of single family homes, condos, townhomes and co-ops declined in November from 1,905,064 to 1,846,155 units in its database of MLS listings from 146 markets. November listings were only 0.18 percent above levels of November 2012, when inventories in the Realtor.com database had already begun the dramatic decline that culminated in the spring, 2013 shortages. The geography of the current inventory declines changed in November. California markets dominated the list earlier in the year, but with the exception of Santa Barbara and Orange County, California markets have been replaced in the top ten declining markets by two Florida markets-which appear to be reentering a second stage of their recovery process–as well as Middlesex-Somerset-Hunterdon NJ, Boulder and Denver CO, Honolulu HI, Detroit MI and, most recently, St. Louis. Santa Barbara reported a 21.24 percent annualized decline listings; the balance all reported year-over-year inventory declines in double digits. Despite the remarkable price gains in 2013-exceeding 13 percent through the third quarter in the latest Case-Shiller numbers and the freeing of millions of owners from negative equity sellers seem to be pulling back. Recent consumer surveys have tracked a significant decline in consumer confidence in home price expectations. In the November Fannie Mae survey, consumers who said prices are going to increase within the next 12 months fell to 45 percent and the average home price change expectation dipped to 2.5 percent from 2.9 percent. In addition, the share of those who expect mortgage rates to climb in the next 12 months remained at an elevated level since it spiked in June. (See Consumers Remain Negative on Housing). With inventory levels enter the winter at virtually the same level last year, should seller remain leery of the market, inventories may not restock sufficiently to meet buyer demand next spring, setting the stage for a repeat of last year’s wild spring and summer conditions. Builders wrapped up 2013 by delivering a surprising number of new home sales for the holidays, normally the quietest time for residential real estate. Sales figures for December aren’t out yet, but some builders said the Sacramento region experienced a mini-burst of activity between Thanksgiving and New Years after months of lagging sales. The slightly better end to 2013 could be a sign of things to come as the 2014 home buying season gets under way, they said. Buyers snapped up four homes at Solstice, a Meritage community that opened Dec. 15 in El Dorado Hills, before any model homes were built, Grant said. Homes there range in size from 2,800 to 4,200 square feet and are priced from about $500,000 to $600,000. At the New Home Company’s Meadows development in Folsom, sales manager Jeff Martin said three buyers signed purchase contracts in the two weeks before Christmas. The small community features single-family homes up to 2,375 square feet near bike trails and shopping. Prices range from $425,000 to $495,000. That’s especially true because only two homes sold at the Meadows in the four months after it opened in September, said Kevin Carson, president of the New Home Company in northern California. “We did in one month what we couldn’t do in four months,” Carson said. Starting last summer, rising interest rates and prices cooled the ardor of buyers, who had returned to the Sacramento market in 2012 and the first half of 2013 after a catastrophic five-year housing crash. The median price for single-family resale homes in Sacramento County had risen steadily for months but flattened at around $240,000 beginning in July, according to real estate information service DataQuick. At the same time, new home sales in the Sacramento region started falling, from more than 250 in April to 79 in August, the North State Building Industry Association reported. The trade group tracks sales at about two-thirds of the new home communities in Sacramento, Placer, El Dorado, Yolo, Sutter and Yuba counties. What drove the holiday home sales? Buyers and builders said it was the belief that interest rates and prices would rise in 2014. “I knew things were going up, and I was a little afraid to wait until the first of the year,” said Erin Safford, who closed on her new home Monday at the Meadows-Folsom. Safford said she made the decision to buy Thanksgiving weekend and wanted to have the keys to her new home by the end of the year. She said she negotiated upgrades on flooring, cabinets and counter tops, and the builder picked up all the closing costs. Safford said she got the impression those bonuses might not be available after Jan 1, so she decided to buy when many others were sitting out the season. Many experts believe home prices in the Sacramento area will continue appreciating this year but at a much more modest pace than the double-digit gains of early 2013. Mortgage rates are also expected to rise in 2014. Last summer, amid speculation that the Federal Reserve would curtail its massive bond-buying program, interest rates jumped from less than 3.5 percent to more than 4.5 percent for 30-year fixed-rate mortgages. News that the Fed would not yet cut its $85 billion stimulus effort pushed rates down again in October and November. Then in December the Fed announced plans to taper its bond purchases, which have keptmortgage rates near historic lows. Rates inched back up, and they are expected to keep rising gradually but steadily throughout the year. Meritage’s Grant said that expectation was probably the biggest factor boosting holiday home sales, though the unseasonably dry weather in December also played a role. Grant said the same perception may help boost sales ahead of the normal spring buying season.